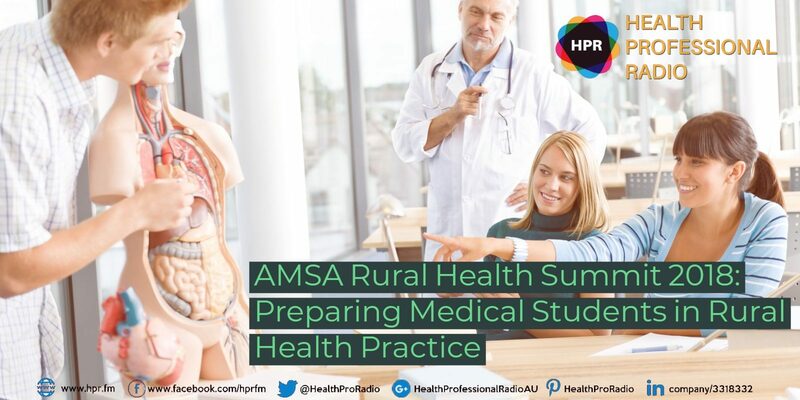 Imogen Hines, Sponsorship Officer of AMSA Rural Health Committee, joins Health Professional Radio to promote the upcoming Rural Health Summit in Albury to medical students on 28-30th September 2018. She also shares her insights on the advantages of being in the rural health service. AMSA is an organisation run by students that represents, informs and connects 17,000 medical students in Australia. Each of the 21 medical schools in Australia elects an AMSA Representative to represent them at AMSA National Council, which is the primary decision-making body of the Association. Imogen Hines is currently in her second year at the University of Notre Dame. Prior for being the Treasurer and Sponsorship Officer of the Australian Medical Student Association (AMSA) Rural Health Committee, she is also managing her own business as an English tutor. Even though she grew up in Sydney, Imogen has a passion for rural health as she loves country life and practice and believes everyone deserves a fair go. Wayne Bucklar: You’re listening to Health Professional Radio. My name is Wayne Bucklar and today, I’m joined by Imogen Hines. Now, Imogen is here to speak on behalf of the Australian Medical Students Association. They’ve got some events coming up but she’s also a doctor to be who’s got an interesting story to tell about her interest in rural health. Imogen, welcome to the show. Imogen Hines: Lovely to be here. W: Now Imogen, let’s start with the Rural Health a bit and we’ll work our way back to the Health Summit before we finish up. Now you’ve got a very strong interest in rural health but you’re not a rural girl, is that right? W: So you’re a Sydneysider by birth. I: Yep. So I grew up in Sydney, I’ve lived in Sydney my entire life but I spent a large part of my childhood travelling into country towns for sport. So I developed a bit of a love there. W: It’s kind of concrete to the story that I used to think was conventional wisdom that the best way to get doctors into rural areas was to recruit them from rural areas as students, a new kind of run countered that plan. How this fascination with living in rural areas come about? I: For me, it probably started because I was travelling to rural areas for sport. So I did have exposure to the country town, the lifestyle but I also think that there’s a growing body of students, certainly medical students and younger doctors who come from the city who are interested in working rurally. It becomes such a not as a good issue to have but it becomes such an issue that there’s actually challenges with providing them with the opportunities they need. So a lot of it kind of comes from the professional exposure and the professional experiences that you get. Medicine is becoming increasingly sub-specialized and even in Metropolitan areas, GPs are becoming less generalists and more specialists in primary care. So I think there’s a real attraction to being able to be a doctor in the later 20th century idea of the term where you’re seeing it as a caseload and a bunch of different patients with different conditions rather than performing appendicectomy all day, every day. And then in Australia at least out, we’re seeing a change in our cities. So the cities are becoming higher density living and becoming more expensive. So you’re seeing a lot of medical students seeking out space and the community minded nature that you have in a rural town. W: And do you think that’s specifically tied to general practice or does that apply to acute care as well? I: It definitely applies to acute care as well. Even within Sydney, you have trauma centers and in the hospital and special settings, you’ll see in a country town a neurologist is a neurologist and they work with the patients with Parkinson’s, patients with neuro disease, patients with stroke, brain tumors, all sorts of different caseloads. Whereas in a Metropolitan area, you’ll be a neurologist that focuses on patients with Parkinson’s disease or you’ll be a general surgeon who does hernia repairs. So it’s definitely something that even within the acute care setting, within the emergency departments, within psychiatry even, that you’re starting to see in Metropolitan areas that highly skilled specialists work and it’s great from a patient care perspective because it means that doctors are very skilled and very confident in what they are doing. But for some people, that doesn’t provide the same level of professional satisfaction that they would like. W: It’s an interesting perspective and it’s one that I didn’t know was there. The kind of conventional wisdom I hear about is well the problem with rural practices is that you lack the support of specialists, you don’t get the long-term care of critical patients, everyone’s med backed out and and so on and so forth. So it’s quite different to the story you’re telling. I: Yes, it’s definitely different I think and it’s something that’s been changing over time particularly with the focus on having rural referral hospitals so there’s a large communities of doctors and specialists in major regional centers. But then you’re also starting to see for instance over the summer break, I was in Nelson Bay which is a coastal town in New South Wales and i’s their time to see radiologists and dermatologists and a whole bunch of specialists come into the town which hasn’t previously been there before and which was work that was done by GPs in the past. W: Very interesting. Now tell us a little bit about the Australian Medical Students Association and in particular, the Health Summit that you’ve got coming up. I: Yep. So the Australian Medical Students Association is an organization that represents over 17,000 medical students in Australia for 21 different medical schools and it’s really quite special organization in that we’re involved with advocacy for both medical students and patients and a lot of our work involves meeting with politicians, formulating policies, government policies and our own policies which we can take to medical schools. But another component of AMSA is running events. So in September, we’re having our annual real Health Summit and that’s being held in Albury and the aim of the Rural Health Summit is twofold, there’s the focus on preparing students who already have an interest in rural health for rural practice by giving them the skills and the tools to be advocates for rural areas. But it also promotes rural practice and the rural lifestyle to students who might not yet be so convinced or don’t know where they’re planning on working in the future. So we have academic events but there’s also social events like a push dance that the students and the delegates really experience at all. W: And how long does it run for? I: It runs for three days. So we start on the Friday night with a gala dinner and a welcome to Albury. It’s being put on by Albury council and then over the next two days, we’ll have academic sessions, social sessions and a whole lot of different things going on and it’s a choose-your-own-adventure conference this year which means delegates get to choose what they want to do and what they feel will be best for their own professional development and it finishes on the Sunday afternoon. W: Imogen, any opportunity for any of the medical suppliers or companies who are listening to sponsor the event? I: Absolutely. So there are plenty of opportunities to get involved with sponsorship. We have a lot of sponsorship packages available and it is a really great chance for medical suppliers, medical companies to come and meet medical students who are going to be their future clients and to take the opportunity to get in early I suppose and create brand recognition and brand awareness from the get-go. If you’re interested in sponsoring us, you can definitely contact myself or our two convenors, Jordan and Dayna via email. I think Wayne, you’ll be putting our email addresses up? I: If they’re interested, they can contact us and AMSA also have a whole host of other events and committees that you can be involved in with sponsorship. W: And I guess for people who want some information in the first place either about attending the summit or about sponsoring the summit, the amsaruralhealthsummit.com is probably the place to go. I: That’s definitely the place to go. W: Now Imogen, it’s been lovely having a chance to have a chat with you today. How many people do you think you’re going to turn up to the Health Summit? I: We’re looking at having 250 delegates and then in addition to that, we have our organizing committee representatives from AMSA and our academic speakers. W: Oh dear, 300 medical students in one place, that could be a hoot I think. Not the medical students have a reputation for partying or anything like that, that’s just wrong to even assume that. I: No. I think we have a very well behaved medical students. W: I think it’ll be a great event. I do hope it goes well for you. W: Imogen, it’s been a pleasure having you with us. Thanks for giving up your time to talk to us today. I: No worries, thanks for having me. W: If you just joined us, I’ve been chatting with Imogen Hines from the Australian Medical Students Association and she’s been talking about I guess the increased migration if that’s the right word, the increased take-up of rural practice by doctors and also about the Australian Medical Students Association Rural Health Summit that’s coming up soon in rural Australia. And you can find details of that as I mentioned earlier at the amsaruralhealthsummit.com website. If you’ve missed that website, the good news is it’s available on the transcript for the show, it’s on our website and the interview is also available as a podcast on iTunes, and SoundCloud and YouTube and you can listen to it there. If you are listening to us in social media, please click the buttons at the bottom of the screen, the likes, the shares, the subscribes, the smiley faces, even the frowny faces, we really do like to know you’re listening. And if you’ve got questions either for Imogen Hines about the Australian Medical Students Association or for us at the station, pop them into the boxes, the comments at any of the social media channels and we monitor them all and we’ll either pass them on the Imogenor we’ll get back to you ourselves. You’re listening to Health Professional Radio, my name is Wayne Bucklar. Thanks for being with us today.